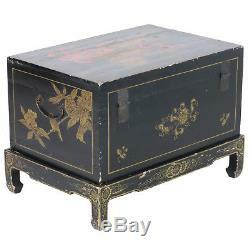 Antique Chinese Black and Gold Trunk with Stand. 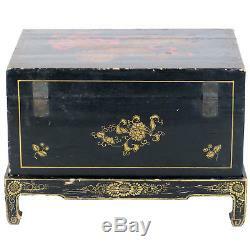 This lovely black trunk is adorned with gold and red paintings on all 4 sides and the top. The front and top feature paintings of Fu (Foo) dogs. The Foo (Fu) dog was actually a lion, not a dog, and were used for protection. The male would guard the door from intruders or evil spirits, while the female would protect the occupants within. 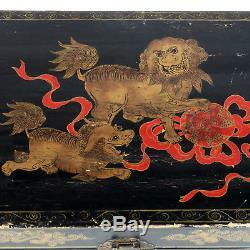 The top of the trunk has the traditional pair of fu dogs with the make in the traditional pose with it's right paw resting on a ball. 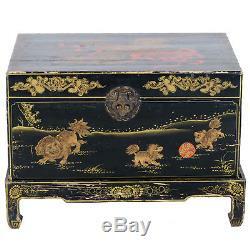 The front has paintings of a female and a pair of cubs in addition to some other gold designs. Each side features a painting of a bird sitting on a branch with some leaves and berries. The paintings are framed in a thin gold stripe on all sides. The back has a much simpler design, but also has the gold frame. The hardware is original, but the key is missing. The keyhole is under the hinged piece of the latch. 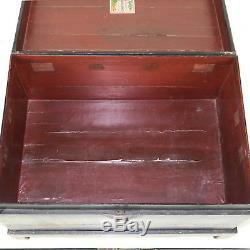 This trunk is constructed with wood, but the entire trunk is wrapped in a heavy paper (or thin leather) before was painted. You can see in some photos that there is some wear on the edges. 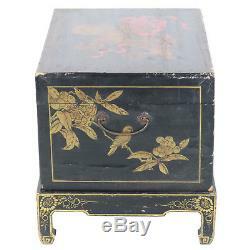 The black painted stand that the trunk sits on is all wood and has gold designs painted on all sides. 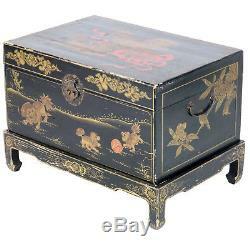 This is a real charming pieces and it's compact size allows it to be used in many areas. 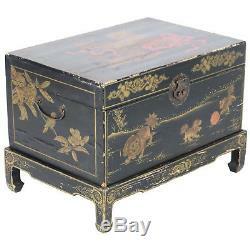 It can be placed at the foot of a bed or used as a small end table or coffee table. 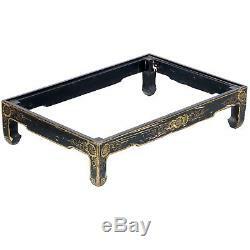 Region: probably Shanxi Approx Age: 100, Late Qing Material: Wood. Trunk is over-layed in a paper type material before painting. Trunk: 27" wide 18-1/2" Deep, 13-1/2 Tall. Stand: 28-1/4" wide x 19-1/4" deep (Overall Height of trunk on the stand is 19-1/2). 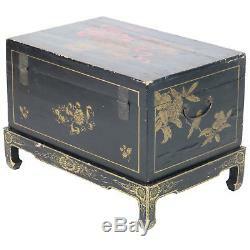 The item "Antique Chinese 27 wide Black Trunk & Stand with Gold Fu Dog Paintings" is in sale since Thursday, September 6, 2018. 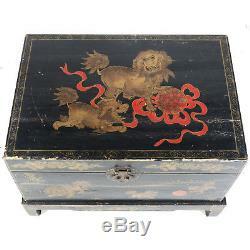 This item is in the category "Antiques\Asian Antiques\China\Chests". 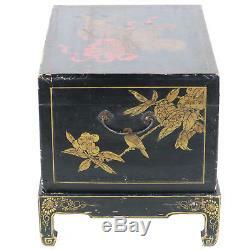 The seller is "asian_country_antique_furniture" and is located in Charlotte, North Carolina. This item can be shipped to United States.